The State of New York may be known for their upscale urbanized cities, but that isn't all there is to this state! New York actually the home of some of Mother Nature's best gifts for ski lovers all around the world. In fact, New York is one of the major ski vacation destinations in America. New York Ski Resorts vary in size, but they all share the unique beautiful views and has the same quality of snow. 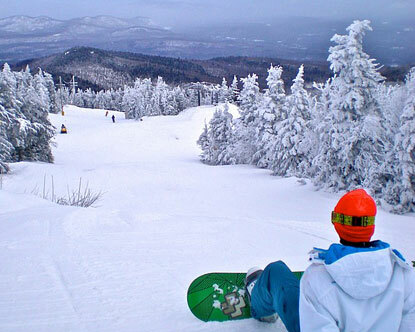 The three ski resorts in this empire state is Hunter Mountain, Gore Mountain, and the Whiteface Lake Placid. This is where the hunt for the best skiing area ends, especially for the beginners and novice riders and skiers. Compared to most other ski resorts in the country, Hunter Mountain has the largest number of beginner trails. This is a proof to their commitment to being one of America's most family friendly resorts. With a total skiable area of 240 acres and 55 named trails, not to mention a massive snow park, Hunter Mountain is a one-stop-shop of sorts for snowsports enthusiasts. There is nothing too 'gore' about Gore Mountain. On the contrary, it is a beautiful piece of ski heaven that screams ski from all sides of the mountain. Of the 50 ski areas in New York, Gore Mountain holds the record for the largest skiable area at more than 320 acres. Every inch of snowcovered terrain here is an opportunity for adventure. Guests can have their fill of snow lovin' from any of the 73 Alpine Trails in the area that includes 12 glades, and 12 snowshoeing/crosscountry trails. Gore Mountain also has five new terrain parks all for riders. This is what makes Gore Mountain a family-oriented resort! This list is truly a list of 'bests' and 'mosts'. Whiteface, the Olympic Mountain, without a doubt. This mountain has the greatest vertical drop not only in New York, but in the entire East coast as well at 3,430 feet. And that is, naturally, paired with a wide acreage of skiable terrain. Whiteface has a total of 283 skiable acres, plus 53 additional acres intended for tree skiing. A mountain this huge has enough space and trails for champions to train and for beginners to learn and fall in love with the sport. The Whiteface Mountain has a total of 86 trails, serviced by 10 lifts. Call a Tour de Sport Travel Specialist and book your New York Ski Vacation Today! !